Since I just got my cover flats delivered last week, I figured we might have to have a little giveaway…. Some people have asked why we get these cover flats? It’s just a fun way to celebrate the book. They’re signed, so….If you want, you can put them right over the book you purchase. That way, if you’re not around for one of my book signings, you, essentially, have a signed book. Some people collect them like movie posters. Some people frame them…but I’m thinking that’s mostly just me and my family. They’re just part of the fun. Okay, I think that sums up the “rules.” Really, this is just in fun, guys, so enjoy. 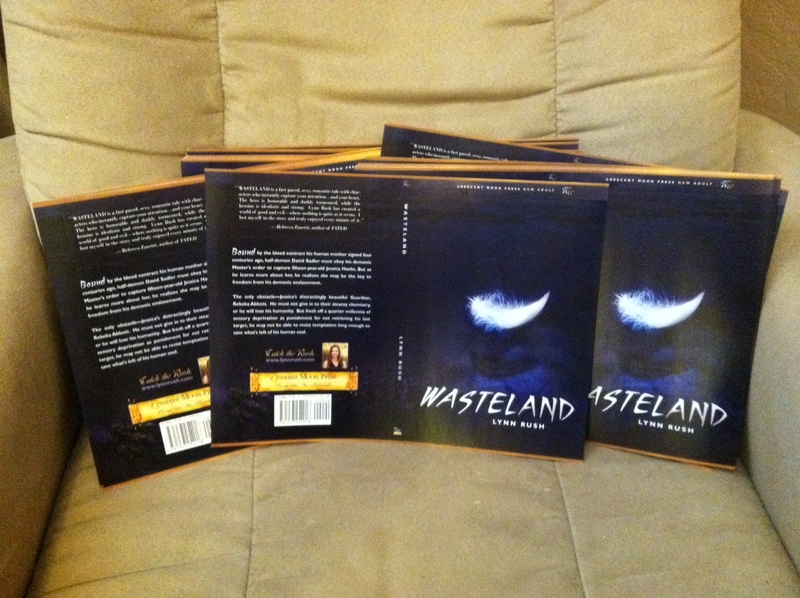 August and September look to be busy months planning for the big release of Wasteland that first week of September! I foresee lots of contests and giveaways…. This entry was posted in Uncategorized and tagged Catch the Rush, Cover Flats, Crescent Moon Press, Giveaways, Lynn Rush, Paranormal Romance, Wasteland, Wasteland by Lynn Rush. Bookmark the permalink. How did I miss this! I must win a copy of this! Please don’t let me be too late! I like the cover image, the small feather about to hit a reflecting pond. That cover would look really beautiful, signed and framed, hanging on my wall. Pretty cover flats!!! Congratulations on the new release Lynn!!! This is so very exciting! Can’t wait to read it. Thanks, Mishelle!! I can’t wait for the world to meet my David. congrats Lynn, I love the cover its beautiful, I love the colors, the single feather, its really beautiful, just wanted to say that, I cant enter cause Im in Canada, but love the cover. Thank you, Natalie. Your comment means so much to me! Me, Me, Me!!!!!! Those are so incredible!!! Quite proud of you, Lynn!!!! Thanks, CK. I appreciate that! I love this cover! The colors, simiplicity, and ominous tone all make it so nice. I’m patiently waiting for the release date.